Need a suit for a wedding? Nas Laine is your man. Published Jan. 27, 2018 at 11:05 a.m. The city's most enterprising, up-and-coming clothier didn't set out to be a suit guy. But men in Milwaukee should be very glad he became one. Like a lot of kids in Africa, Nas Laine wanted to be a soccer player. Growing up in the Ethiopian capital of Addis Ababa in the 1980s, the sport was his passion, and it was soccer – as well as schooling – that drew him to London, where his father worked as a commercial attaché at the Ethiopian Embassy. Playing for the Crystal Palace F.C. youth team as a promising teenager, Laine traveled all over Europe, visiting Paris, Milan and other cosmopolitan cities across the continent in the early 1990s. When a knee injury eventually ended his hopes for a professional soccer career, Laine spent a year getting his General National Vocational Qualification – essentially an associate's degree in England – in Information Technology, though he wasn't passionate about the field or school in general. Worldly for a 19-year-old and looking for something to do, he decided to come to the United States with his mom – "my pride and joy," he says – who was moving to Madison, where her sisters already lived. Settling in a new country – and Wisconsin not exactly being London in the late-90s, or now – without soccer, Laine felt lost, undecided about what to do. His mom, as a mother will, soon told him, "You have to do something," and helped Laine get a part-time sales job where she worked, at the menswear store Bachrach, then one of the largest retail clothing chains in America. "My affiliation with clothing is directly because of my mom," Laine, 38, says of his mother, a master tailor who now operates her own business in Madison. Competitive, charismatic and industrious, drawing on an interest in fashion first sparked by his dressmaking mom in East Africa and subtly enhanced in multicultural Europe – and with the help of Willie Watkins, whom he says was "an amazing mentor who really pushed me" – Laine developed a highly successful sales style built on sincere customer service and interaction. At the time, Bachrach had a Founders program, in which it honored the top 20 salespeople of the company's 50-plus nationwide stores who sold $500,000-$1,000,000 in inventory. One year, finding in December that he was about $100,000 shy of the Founders threshold while working at his C-level store in Madison, Laine decided to move to Milwaukee, where Bachrach's Mayfair location was one of the country's top retailers. Living in a motel across the street and knowing he had to do more than three grand every day for the final month, Laine hustled and hawked and built relationships. He took no days off and on Dec. 29, he made it, becoming one of Bachrach's youngest-ever Founders. From that point on, Laine knew what he wanted to do, loved it and flourished. He worked at the company for more than a decade, doing sales, training and development, opening stores, learning the day-to-day operations, honing his entrepreneurial instincts and, crucially, building a network in Milwaukee. As Bachrach downscaled in the late 2000s, Laine planned how he'd run his own custom clothing company, valuing client service, listening to people and fulfilling needs. Through his industry connections, Laine got in with a major Korean textile manufacturer that helped him start his business and with which he still works today. After taking a trip to Africa to see some family, Laine returned to Wisconsin and informed Bachrach he was leaving, telling himself he had to take a chance on his idea. Laine rented a small office space overlooking Mayfair Mall on North Avenue, opened his appointment-only business called Fittings By Nas and tried to sell custom suits. Despite plenty of zeal and a customer base forged from his time at Bachrach that he thought would follow him, Laine struggled the first year, saying in hindsight he was "oblivious." Men don't easily change when it comes to where they buy their clothes, he says. "I found that out the hard way." But he was determined to improve just a little bit each year. "I pushed, stayed and was still happy doing it because it had my name on it," Laine says. Slowly, he began bringing in his old clients and attracting new ones. "I spent four or five years in that location, really tuning into everything," he says. "I was very methodical with what I wanted and how I wanted to grow. I saw an increase in business year to year, and I saw how to do it and where I wanted to go." Looking to expand his largely suburban customer base, Laine decided that where he wanted to go was the Third Ward. "I had the vendor relationship, I had the best turnaround, I had the best price point," he says. "But how do I put one of these suits on everybody?" By 2012, Laine had moved into the basement at 241 N. Broadway St. and set up shop there. Even from underground, his business – now called NL Suits – picked up, and he knew he'd found his anchor location. The next year, a tenant was evicted, and Laine went upstairs. It was an awkward space, crammed in between a shoe store and a jeweler, but – as he tends to do – Laine bonded with his neighbors, worked hard and continued to grow. 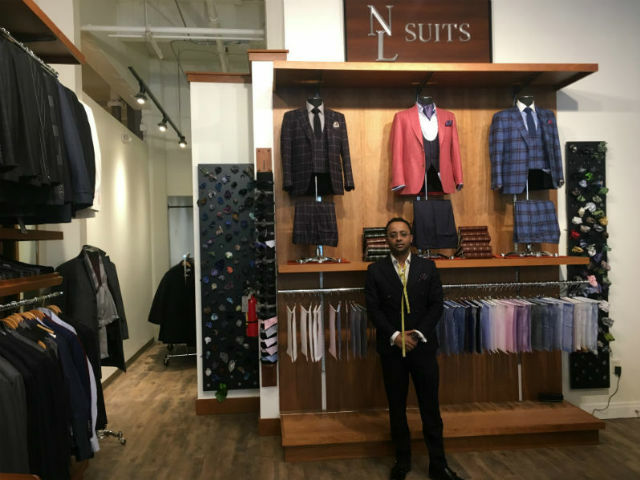 Last year, he moved again in the building, this time to a prime storefront spot, where he displays his suits to Third Ward passersby, has more well-arranged space and dressing rooms and a full tailor in the back. "Delivering a supreme product at the best price point was always the motive for me," Laine says. "I always say I want to put a custom suit on the kid that's graduating from high school." When he first started out, Laine sold custom suits for $495 with almost no profit margin "because money wasn't important to me; building a brand was important," he says. Laine wanted to bridge the gap between a customer buying an off-the-rack suit and making one, which can cost $1,000-2,000. But as his business picked up and he started to do more volume, Laine increased the price to $595, then $695. He felt like he was getting away from his mission, though, and at the same time, his company had gained enough exposure and traction to be able to return to its original, entry-level price. 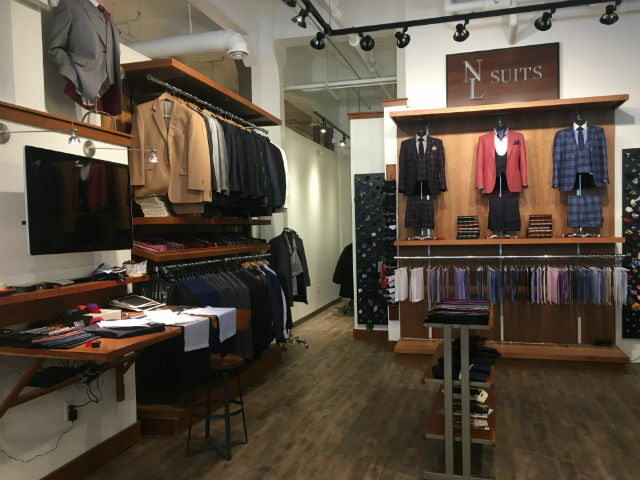 Last month, NL Suits negotiated with its vendor to go back to selling custom-made suits for $495 – as a thank-you, Laine says, to his customers – with the same two-week turnaround. "I want to be known as a suit guy. People around town will say I get my suit from Nas," he says. "I never thought I'd see the day when we're selling 80-90 suits a month. When I first started it was tough to do two or three a month. But we stayed with it and we're persistent and we have the best customers. My business was solely built on word of mouth; clients that have the best interaction here are able to spread our message in a way nothing else can." Laine was one of the most talented and accomplished salespeople at Bachrach. Even now, sitting next to him in his store, it feels like he could sell you the tape measure draped around his neck if he wanted. But even while he was annually winning commission incentive contests at his old company, he didn't like the turnover culture. "I looked at it completely the other way," Laine says. "I would spend 20-30 minutes with the customer, put two tables together, have a show in the store, create this whole experience." That's why NL Suits is appointment-only, he says. He relishes the opportunity to talk to customers, listen to their preferences and pay attention to their needs, introduce them to what looks good and concentrate not on price or volume, but on "the infectious feeling that we want to bring our clients." It's show, not sell, and it's a lot of fun in the store. "That's our mission," he says. "I don't care if we don't sell a dime, but who came in and what type of service did they get? I see the trend, especially nowadays, shopping is really experience-based. I secret shop a lot of places, I see what type of service is out there and I always say wow, I'm glad this is our mission." By now he has lots of regular customers. "They'll say Nas, I need a suit; you know my measurements, here's my credit card," he says. "I don't take that lightly, so there's a lot of effort that goes into it and a lot of passion in what we do." Laine personally designs a half-dozen pieces in his home each season – even if they don't sell, they start conversations – and his sense of style influences the store's selection. "You find clients that say, 'Nas I never would have bought that, but it's my favorite,'" he says. "It really encourages the client to think that way, especially guys, and they're not in the industry to be able to see and think that way." Milwaukee, Laine says, was one of the biggest suit markets in the U.S., though the business "sort of died out" over the last decade. With NL Suits, he's concentrating on menswear, filling a void in the city. Last fall, Laine put on a fashion show at the nearby Kimpton Journeyman Hotel and, on three-week notice, almost 400 people showed up for a party that he now plans to throw every year. When asked about the stereotype of Milwaukee being a less-fashionable late adopter, Laine is adamant. "That's very false. That's just a notion that everybody thinks, but it's the opposite," he says. "I've noticed a change in this city in the last two or three years, but we need people with vision – like I had – in all sorts of things to kind of guide it, to be a little bit more courageous, to feel your guts and just go with it." February means the beginning of wedding-planning season, NL Suits' busiest time, and Laine is committed to offering different, better, cooler and cheaper options than other stores. The traditional tuxedo, he says, is out. ("And it should be out, especially for the most important day of your life," he says. "What are you going to do, rent a suit that's been barfed on by teenagers?") Whereas most men assume – or prefer – they have very few choices when it comes to suits, Laine helps guys realize the myriad fit, styling and accessory options available, all guaranteed to be ready for pickup in two weeks. "I think the reason we did so well last year goes hand-in-hand with the mission we have overall," Laine says. "We treated that wedding client, groomsmen or guest or whoever, like it was their wedding. Girls have that experience, but guys generally don't." Laine's suited up men in flannel, linen, seersucker and wool for weddings. They come in, take an hour to talk style and be fitted in his Third Ward store, spend less than half what they'd pay somewhere else and have their custom suit, made-to-measure and of premium quality, in just two weeks. "You can buy clothes anywhere," Laine says. "You can find nice suits anywhere in the city and online. But there is something about the relationships you build with people. "I remember when I first started, the biggest thrill that I got in men's clothing, the biggest satisfaction I got, was from the amount of compliments my clients received. I always felt that way."